Otrivin is a coupon that you can find on Save.ca’s website. Select the coupon and you can either print or have the coupon mailed to your mailing address. The coupons are all mailed for free. You will get them within 2-3 weeks. 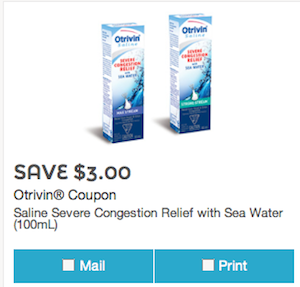 Otrivin coupon is to save $3 on saline severe congestion relief with sea water (100mL). Otrivin coupon is valid only in Canada. You can used the mailed or printed coupon in any major supermarket such as Shoppers drug mart, Loblaws, Walmart and more. 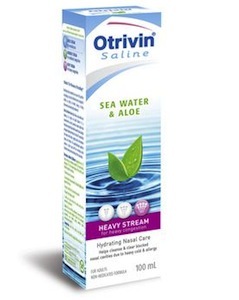 Otrivin Sea Water & Aloe helps to keep nasal cavities clear allowing us to regain our natural balance. It is a preservative-free, isotonic, natural sea water solution that helps clear congested nasal cavities caused by colds, allergies and upper respiratory infections. It contains 5% natural Aloe Vera extract, which helps to gently soothe and moisturise dryness and irritation. You can find Otrivin congestion relief at Walmart of $10.97. With the coupon you will only pay $7.97.